With his stellar play for Canada at the under-18 world hockey championship, phenom Connor McDavid has solidified his position as the presumptive No. 1 pick in the 2015 NHL draft. SOCHI, Russia — From his perch in the stands at Shayba Arena, Al McAdam watched wide-eyed as Connor McDavid made another highlight reel play in Canada’s game against Sweden at the under-18 world championship. McDavid, who's only 16, banked the puck off the back of the Swedish net, did a spin-o-rama, picked up the disc on his stick and then slid a soft pass out front where Morgan Klimchuk tapped it in for a goal en route to a 6-0 victory and top spot in Group A. Not that there was any doubt about McDavid's skills, but McAdam and every other hockey bloodhound in the stands was impressed, again. "He has creativity and he is courageous. That is what separates him from the rest,’’ said McAdam, the former NHL player and coach who now scouts for the Buffalo Sabres. "He has the skill level… he has a real good work ethic. He is on the puck and he works well off his wingers. I think if he was up for the draft this year there would be a lot of talk about him going No. 1. In his draft year , it is pretty much decided. "He is a threat every shift." The annual under-18 championship is the last international tournament featuring players eligible for the NHL Entry Draft in June. The star of this year's edition of the showcase event was supposed to be Valeri Nichushkin, a slick Russian forward who has been on everyone’s top-five list of prospects all year. Nichushkin found himself embroiled in controversy before the start of the tournament when Russian President Vladimir Putin all but demanded in the Russian media that the teenage phenom be released by his Kontinental Hockey League team before the end of the playoffs to play in the under-18 tournament which is being used as a test event for the Sochi 2014 Winter Olympics. But KHL officials would not let him go and his team was defeated in the sixth game of a best-of-seven final, after which Nichushkin was flown by private jet to play in the U-18 event. And while Nichushkin has shown next to no interest in stepping up his game — his body language says it all — McDavid has filled the void as the tournament’s top player to watch. "I guess you could say he is kind of The Next One. Every so many years [a player arrives like] Gretzky, Lemieux. I think he is making a statement. Is he [the next Sidney] Crosby? I think he is the next guy," said Jim Nill, the head scout for the Detroit Red Wings. "He has elite vision. He has the ability to play the game at any speed and he dictates what the speed is. He can slow it up and he can speed it up. He does whatever he wants. He reminds me a lot of [Red Wings star] Pavel Datsyuk." McDavid has five goals and 11 points in four preliminary-round games, including a hat trick against Sweden. He has been improving every game and his efforts are one of the reasons why the Canadians are on a roll as they head into Thursday's quarter-final match against the Czech Republic. 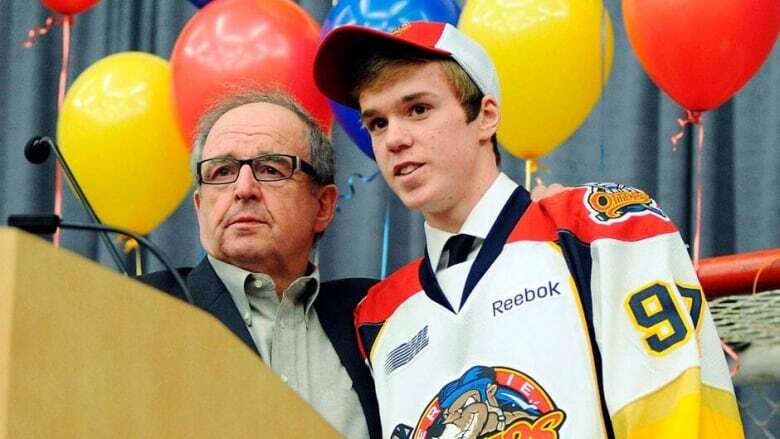 McDavid had 66 points in 63 games for the Erie Otters of the Ontario Hockey League this season, second among first-year OHL players. McAdam feels McDavid has been much more consistent at the 10-team U-18 event because he is teamed with better players. "Most players, there is something you have to get better at, but he does not look like he has to get stronger. At this level, he is strong. He would be [drafted] first overall this year, no questions." Canada coach Don Hay has no problem sending McDavid over the boards in any situation. "He's very solid," Hay said. "He makes good decisions with the puck. He's very unselfish and he plays both ends of the ice. He's done a great job. He's like our team, he's gotten better and better each game. We just want him to keep on working." The Russians have made excuses for Nichushkin's lacklustre play and they have not made him available to the media. In contrast, McDavid will probably win the award for the most sought-out player if there was such an honour. And when he answers question after question about his performance, there is little, if any, mention of "I did this" or "I did that." McDavid is all about winning. McDavid is used to being in the spotlight and in some ways he has lived in it all his life. He has played against older kids since he was a child. When he was four years old, his parents lied about his age so he could play organized hockey in a league for five-year-olds. He dominated then just like he’s now dominating in a tournament against older peers. When he was 15, McDavid applied for exceptional player status so he could join the OHL a year early. Players who apply for exceptional player status are evaluated on multiple criteria, including on-ice ability, academics and maturity. He passed the criteria with flying colors. The under-18 tournament wraps up on Sunday, and if Canada makes it to the final there is every chance McDavid will have continued on a tear. And should Canada face Russia, it could make for great theatre. Not only would the old rivalry be renewed, but the gold- medal game would showcase the player who some feel could be the top pick in the June draft — Nichushkin — against the wunderkind who would be No. 1 if he was eligible. "It is all about motivation, isn't it?" said McAdam.